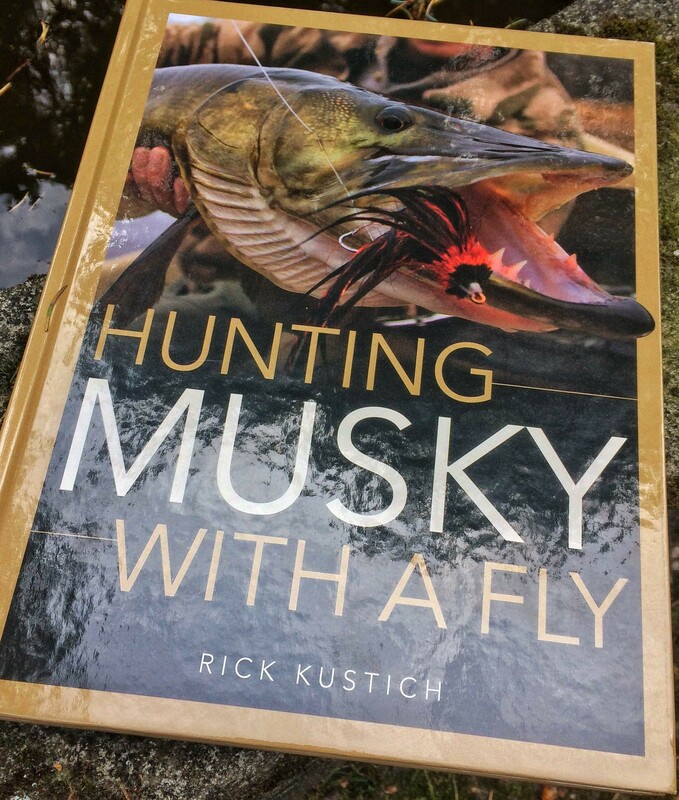 ”Hunting Musky with a Fly” is the highly new anticipated book written by long term fly-fishing expert Rick Kustich. It’s a perfect example of a what catching Musky on a fly is all about these days. Jam packed with tons of great pictures and information, this book is something that should not be missed on every serious Esox angler’s book shelf! Let’s start from the beginning. When you first hold this book in your hands, and see the awesome cover, you can only guess what’s inside, as I was when I first received it in the mail. This book is a hard cover, and with it’s 190 pages, it’s truly something special! The way it has been written, the overal selection of photo’s, and what you are able to find inside, makes it a must read! When you’ll first open this book, you will notice the order of content in which the various subjects have been written down. There is really something inside for everyone. It doesn’t matter if you are the one just starting out hunting for Muskies with a fly, or an avid angler, or even a Pike angler, the words that you’ll find inside are the one’s that will lift up your fishing, and it enables you to find many great stories that have been written down by Rick from all kind of different fly guys in the industry. 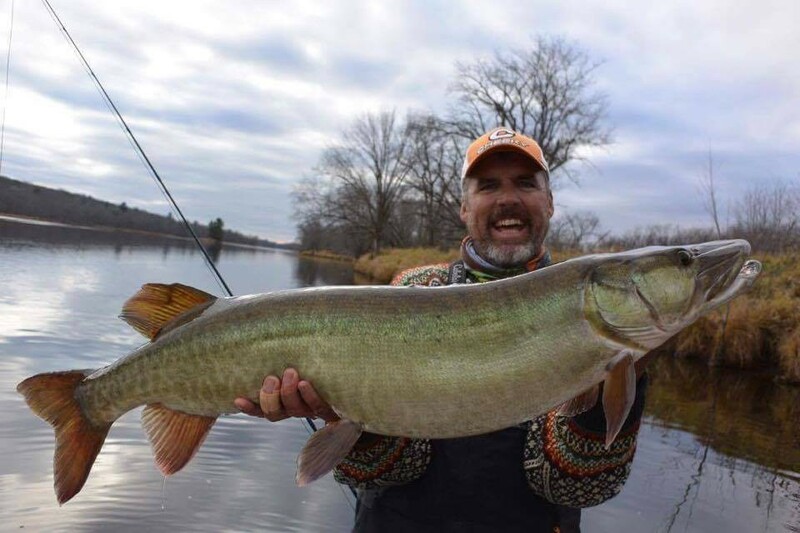 Blane Chocklett, Brad Bohen, Eric Grajewski, Mike Schultz and many more, will tell you everything you’ve always wanted to know about catching Musky on the Fly! At the beginning of this book, in the chapter ”Profile of a Predator” you can find very usefull information about the fish of 10.000 casts; the Musky it self! Rick describes many places of Musky habitat, as well as a bit of history, and perhaps the most important thing of them all: behaviour. Where and when to target the illusive Esox, is something you’ll be able to read here. Again it doesn’t matter if your’e an expert angler, or just someone new starting out, this book is so well written, that anyone can learn alot from it. The conditions and techniques described in this book are very much related to the Pike fishing, and especially fly-fishing for Pike. Even though it’s not exactly a Muskie, there is an incredible amount of solid information in this book to be found for the angler. These days, fewer books on the market produce quality content, because most fisheries are already written about, but this book includes some secrets which have never been told before, and that’s what makes it so interested to read! The second chapter ”Getting Your Head in the Game” is something that can be read over and over again. It basically tells you to never ever give up when targeting Musky on the Fly, but also gives you some highly valuable tips on how to stay heads up in the game at any time, and stay focussed to not miss the fish of your dreams when things aren’t going the way they should be, or how you want them to be. It’s tells you the pure essence of what fly-fishing for Musky is all about, and once you master this inside your head, less things can go wrong. ”Rigged and Ready” is a great example of how you are able to target Musky. Every little aspect of gear and equipment is described here, from rods to reels, and from lines to boats. Rick explains exactly what you need, and more importantly, why you need it. The pro’s and cons of using different materials, and his experiences from the water are shared here. One thing that’s really well described here, is Rick’s view on using various leader materials, probably one of the most underestimated items in the fishing world today. And last but not least, boats. All you need to catch the fish of your dreams. Nowadays most people use heavy flies, that are 10 inches or more. It requires a specific type of rod which enables you to cast these flies, but more importantly, how to cast those big and chunky flies. In ”Making the Cast” Rick explains in a step by step guide with pictures, how you can get the most out of your day on the water by making the perfect cast, to throw those large pieces of fur into the unkown. The basics are well written down, as well as accuracy, and making distance, which is probably one of the key factors for Musky fly-fishing. Covering a large amount of water in a relatively short time. It’s all included! Where and when to find the illusive Musky, that’s always the question. There are many places where one can go fishing. This episode is probably the most exciting one of the whole book! In ”Musky Habitat” Rick shows you where and when Musky can be found. Basically every body of water is covered here. Lakes, large rivers, smaller rivers, creeks, structure, weeds etc. 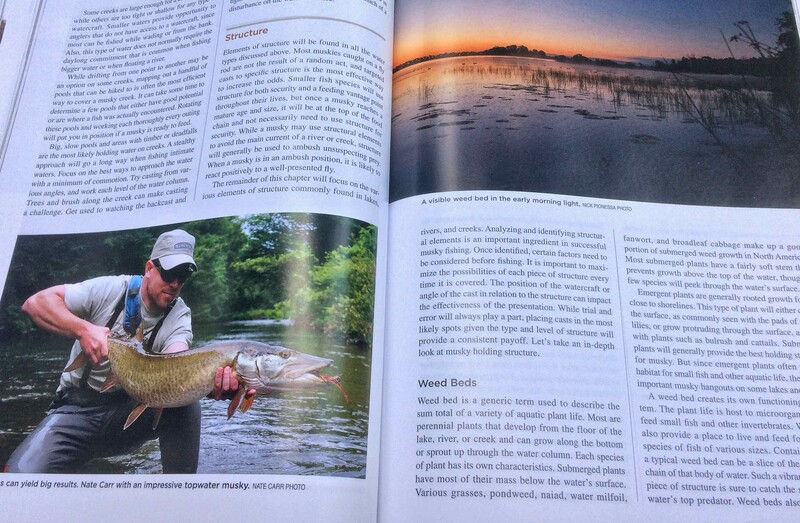 This chapter tells you all about the home of Esox. This is not only a highly valuable read for the Musky fly-angler, but also for the Pike enthousiastics among us. In fact, Muskie fishing can be similair to Pike fishing in many ways. For the European readers, this can give a great insight from a complete different approach, in which you can find new inspiration for catching the fish of your dreams. Rick has done an amazing job in explaning everything you’ve always wanted to know on how to approach any kind of circumstance, under all kinds of conditions! Casting and location fish is one thing, presenting your fly to the Musky is another. You guessed it right! Chapter 6 is all about ”Presenting the Fly”. Fly-fishing these type of fish is not just casting out and stripping your line back in. There goes a whole lot more behind this philosophy. Succes in Musky fly-fishing often comes down to proper presentation of the fly. Think about speed, right depth etc. There are many factors that play an important role here. How and where to place your fly, dealing with followers, and probably the most important thing of all, hooking and landing. That’s what we all go out for in the end right? Rick describes from start to finish how to cast out, pull your fly back in, and hook that one fish of a lifetime properly, before it swims away into the dark depths waving it’s tail at you. Not too long ago, Musky fly-fishing was a sport that was unkown to many of us. There wasn’t a whole lot of information written about, and it was unexplored territory. Thankfully some unknown fly-guys, that are well known these days took the gamble of trying out different things and techniques when it came to hunting Musky with a fly. People like Brad Bohen, Blane Chocklett, Eric Grajewski, Chris Willen and Bill Sherer. Rick has done a sort of Q&A with all of them, and they tell the reader exactly what their view is on the fishing as we know it today. It’s very interesting to read their personal experiences, as every angler has a different approach. There are questions included such as the type of water fished, the key to succes and memorable Musky encounters. If you want to learn from the pro’s, then this one is for you! Muskies can be found in specific parts of the United States of America, as well as Canada. In ”Musky Geography”, Rick tells you what parts of the country hold these illusive fish. Musky can be found all across the Northeast over to the south and midwest. Every body of water is included, and Rick has given you an insight where you can start your approach for the fish of 10.000 casts. And last but not least: Flies! ”Essential Musky Flies” shows you a wide variety of different Musky fly patterns tied by some of the best fly-anglers. I personally really like this chapter, because it gives you an insight on how to tie all kind of different flies when it comes to fishing for Musky. Everything is described here. 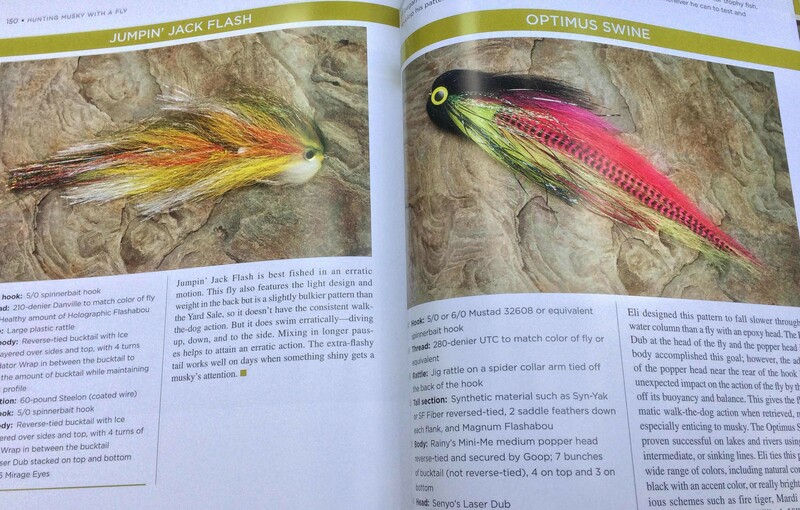 All the way from hook sizes, to the kind of materials used to tie the Musky flies included in this chapter. Each fly has a detailed description of how it can be used, as well as what it was originally designed for. If you are new to tying Musky flies, and you don’t have a clue where to start, the flies included can give you a great insight, and who knows it might work inspirational for you to develop a whole new pattern yourself. Beautifully photographed! 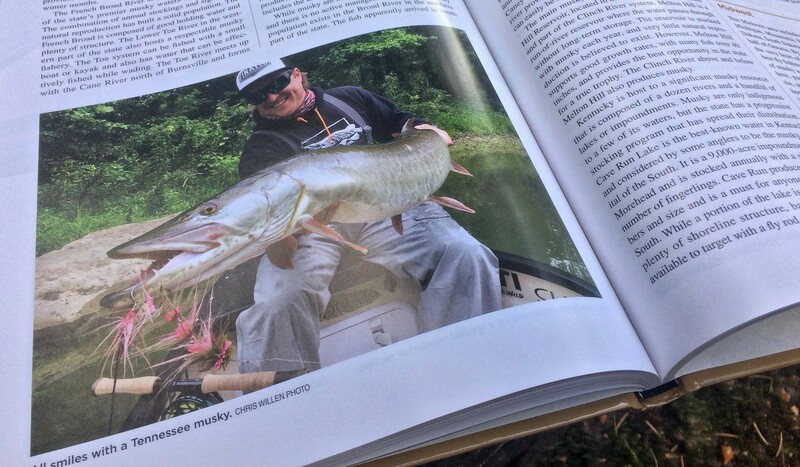 With this review, you will have a a little idea of what you can expect when purchasing ”Hunting Musky with a Fly” by Rick Kustich. It is an absolutely MUST read. Rick’s style of writing takes you on a tour into the world of fly-fishing for Musky, and once you start to read, there is no return. You keep wanting more and more, because everything included, all the stories, picutures and experiences from the pro’s that are features inside, come straight out of the field. If you are serious about your fishing, and looking something really special, then this book is for you! If you have become interested in buying this book, you can do so by clicking on one of the following links down below. Rick also offers signed copies for those who are interested!